Learning to teach others to fly! What exactly is the Flight Instructor Ground School Seminar? Well the analogy goes something like this: If you wanted to be a certified school teacher in this country, first you would be required to “student teach”. Student teaching is a process through which you are assigned to the tutelage of a highly experienced, supervising teacher. Through the process you learn to run the class as if it were your own and to develop your technique as an educator. Amazingly, the Federal Aviation Administration (FAA) has no such requirements or expectations of pilots seeking to become CFIs. Sure, the flight instructor check ride is designed to assess the pilot applicant as a “teacher”, but if the person pulls it off, they can literally begin teaching, sans supervision, the very same day they receive their flight instructor certificate! At Premier Flight Center, LLC., we believe that this isn’t anything close to adequate! We require our Certified Flight Instructor (CFI) applicants to really teach, a lot, before they even take the CFI check ride. 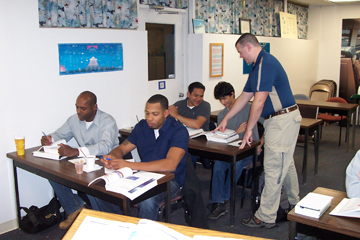 Most other schools simply require, at most, the student CFI give a “presentation” or two to a group of instructors. To us, it would be silly to begin teaching students without first having some diverse teaching experiences! So What Does Premier Flight Center Do About It? Premier Flight Center runs a “Flight Instructor Ground School Seminar Class”! We have a group of highly dedicated would-be flight instructors. On a weekly basis in our classroom, they take turns presenting the material that, ultimately, they will be responsible for teaching to their students. While teaching, the CFI students are supervised by and receive input and feedback from various, experienced professional instructors from Premier. And also in the classroom, there are numerous “real students” who are exposed to a variety of material that is review in some cases and completely new in others. Indeed, yes! 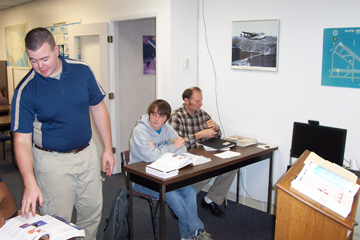 Student pilots and even a large number of licensed pilots attend the seminar class, for free! And why would our instructor applicants want to teach them? Well, the frustration of every pilot trying to earn their CFI is “teaching” his or her instructor. They know that their instructor already “knows” the material…they’re not, in their minds, “really teaching” anyone anything! However, when they teach “real” students, they experience the risk and the frustration of not getting through to them. They’re faced with altering their presentation in real time when they say something that isn’t understood and they are challenged with tailoring it to the class’ varied level of understanding. Then, they experience the joy of successfully guiding a person from not knowing something, to understanding new information! You bet it does! Using this method, our CFI pass rate is practically perfect! And that’s saying something. Pilots will tell you that, nationally, the first time CFI pass rate for the flight instructor check ride is only around 20%! Beyond that though, our instructor graduates really are ready to climb into a cockpit or stand in front of a classroom and teach the next generation of pilots!